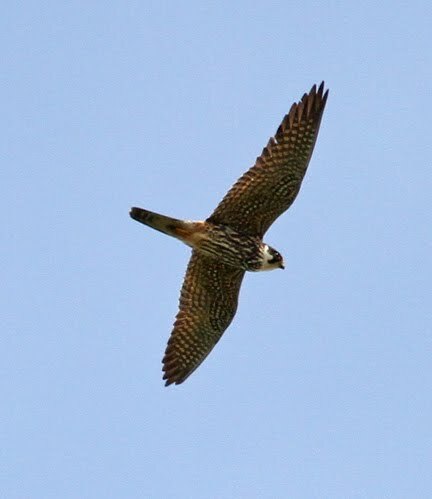 Local patch: Hobby - Brockholes Nature Reserve LWT, Lancs - 28th June 2011. 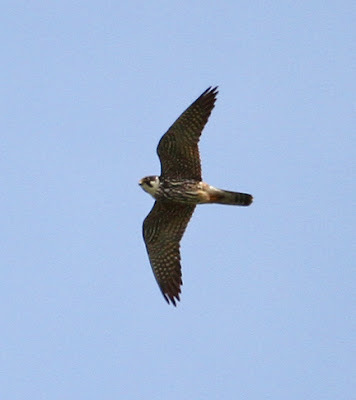 A second calendar year bird flying SE over the car park area mid-pm. 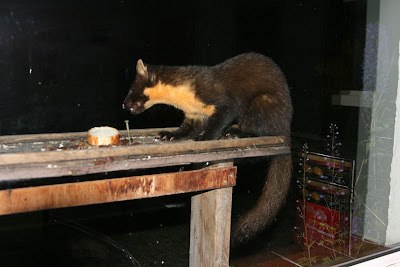 Pine Martens: Loch Sunart, Argyll, Scotland - 15th June 2011. 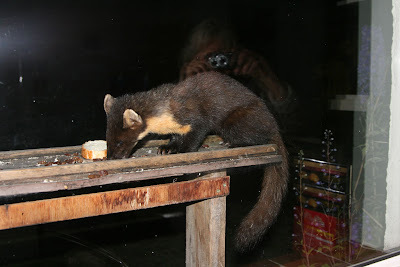 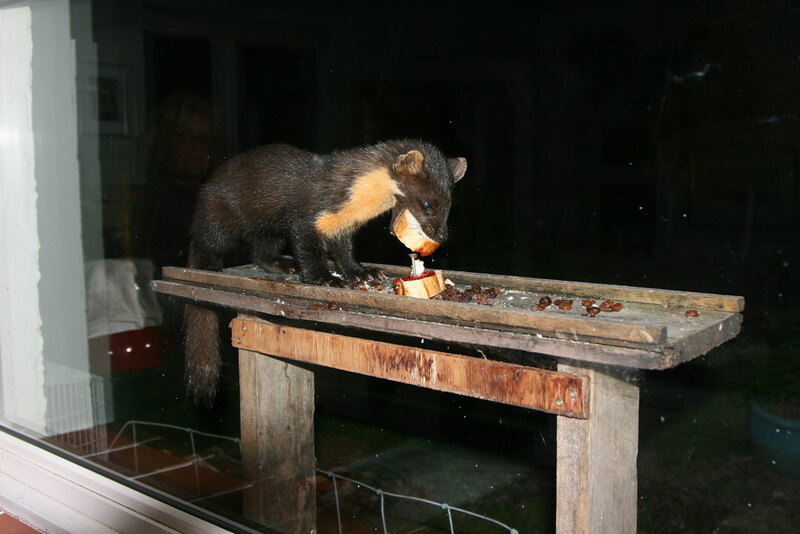 An absolutely thrilling evening was had watching my first ever Pine Martens at a Bed & Breakfast nr Strontian, Argyll, on the north shore of Loch Sunart. 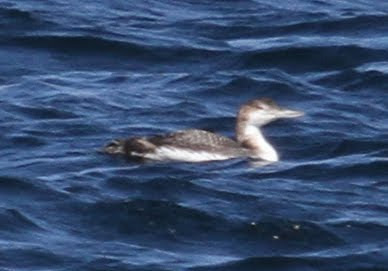 2CY Diver - Western Isles, Scotland - 12th June 2011. Considered to be a White-billed Diver at the time, this bird has generated much debate, with a number of eminent birders firmly of the opinion the bird is a Great-northern Diver. 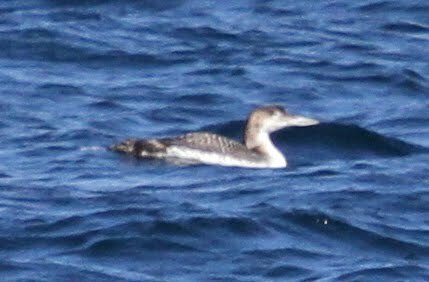 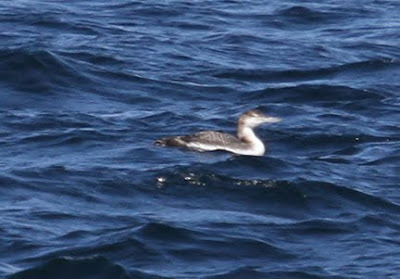 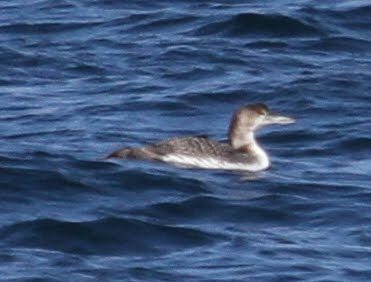 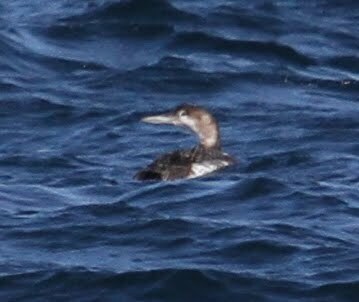 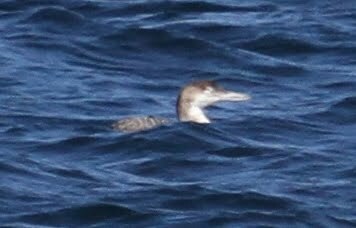 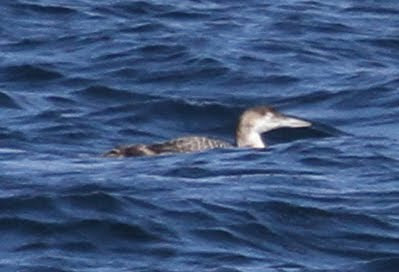 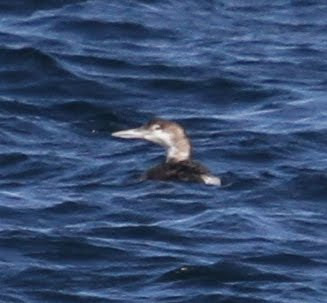 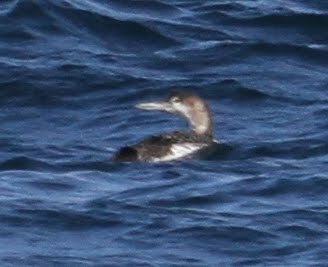 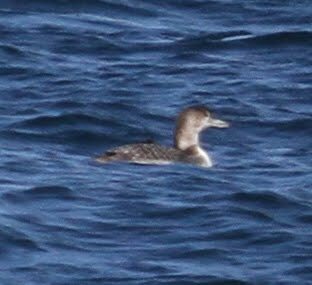 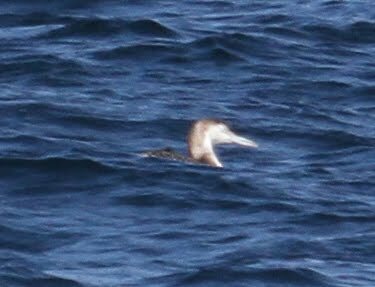 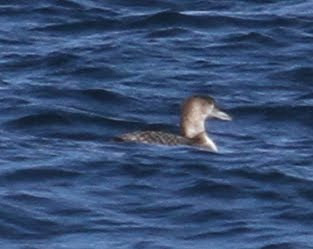 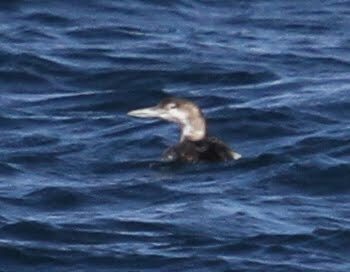 Below: 2cy Great Northern Diver - 11th June 2011. 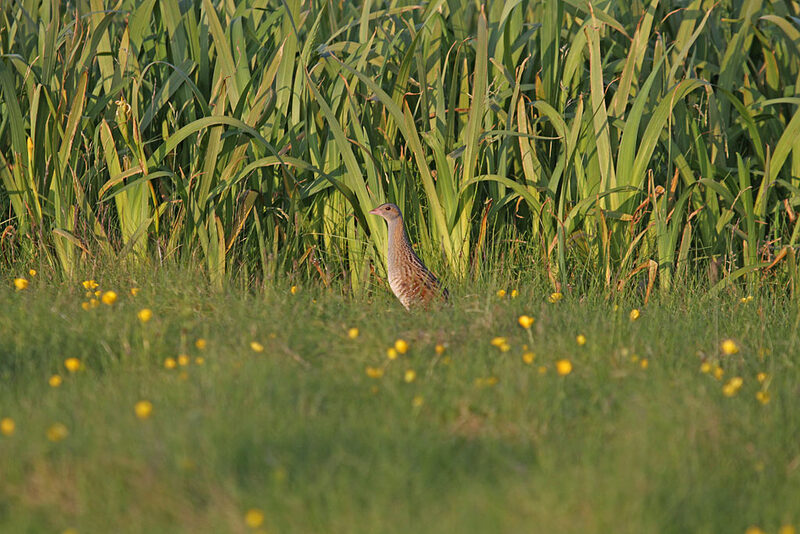 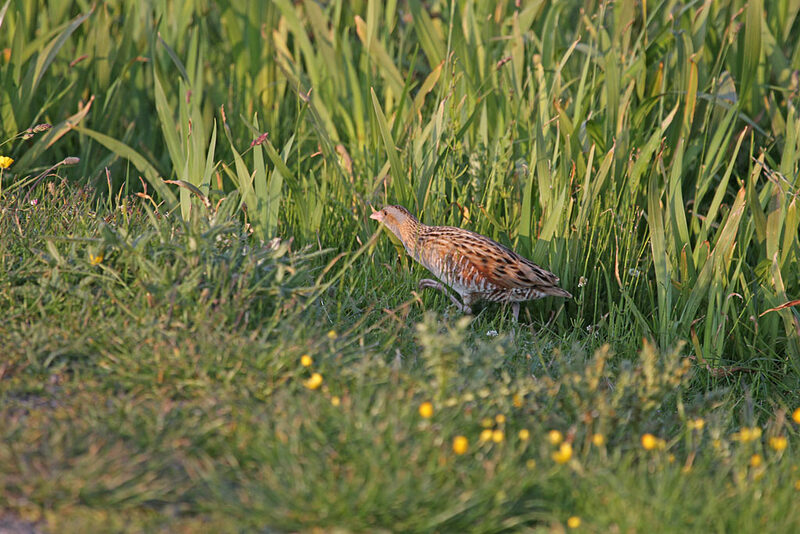 A fabulous encounter with a Corncrake, a species I have not seen for years. 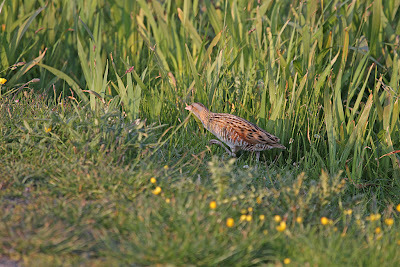 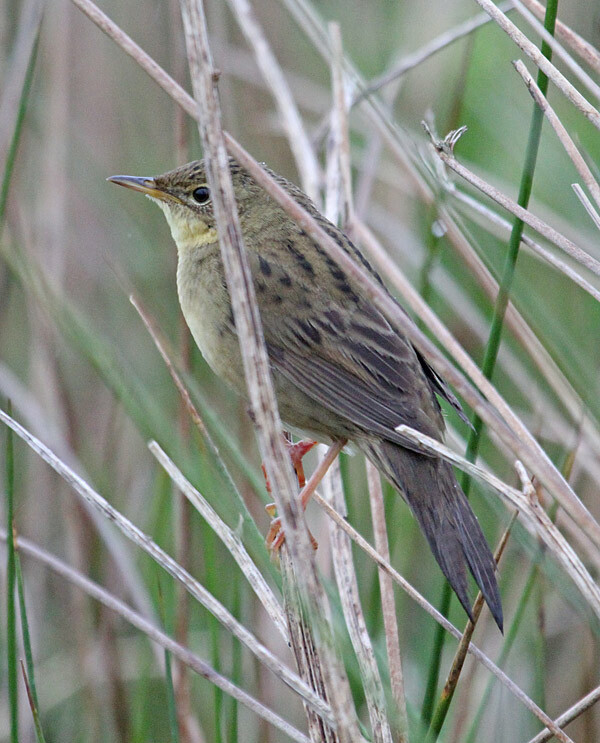 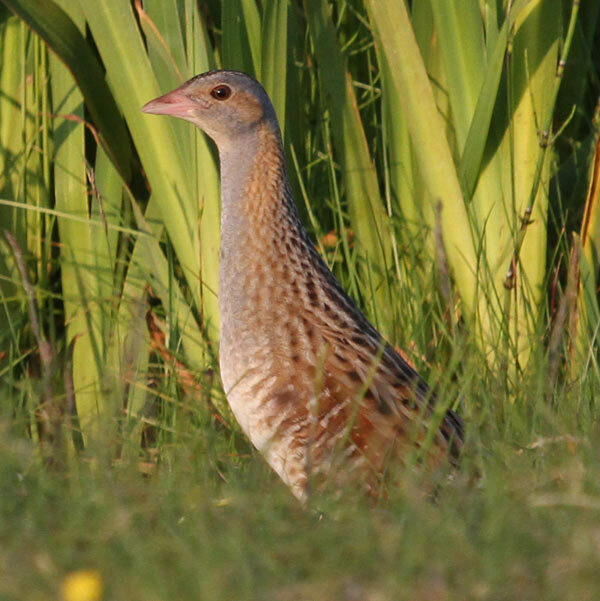 I am out of touch regarding the status of this species in Britain nowadays, and was absolutely staggered to learn that there were 391 calling Corncrake on Tiree alone in 2010!! White-throated Robin twitch - Hartlepool Headland, UK - 6th June 2011. 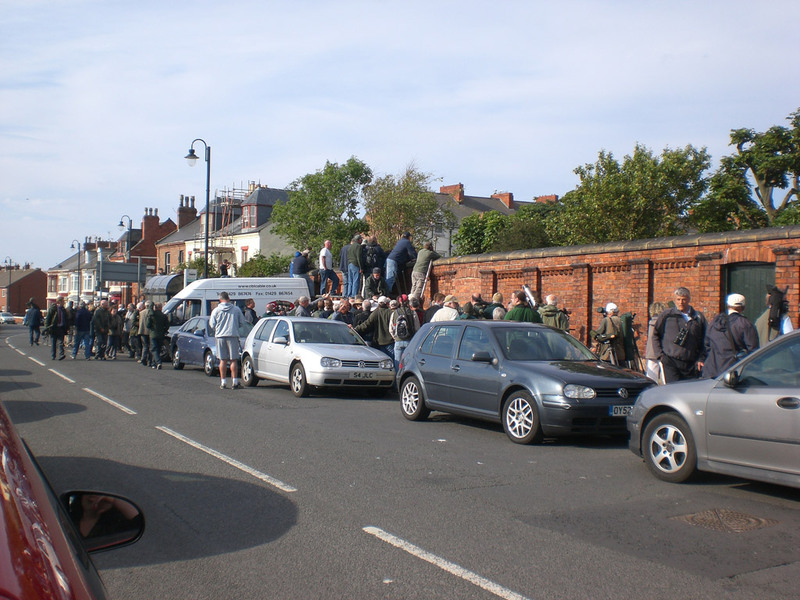 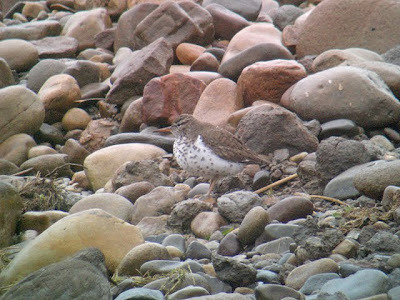 An emergency twitch was organised following the stunning news of a female White-throated Robin trapped and ringed on Hartlepool Headland. 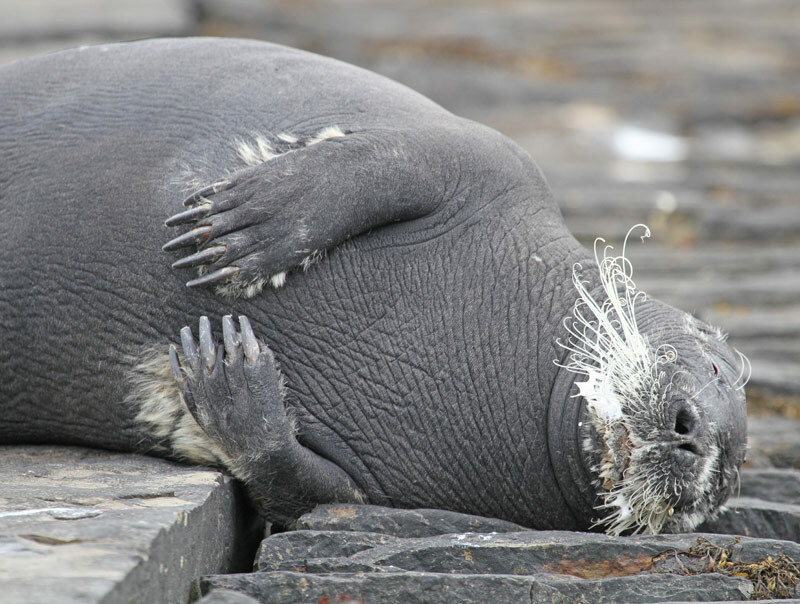 The team comprised of Myself, Cllr. 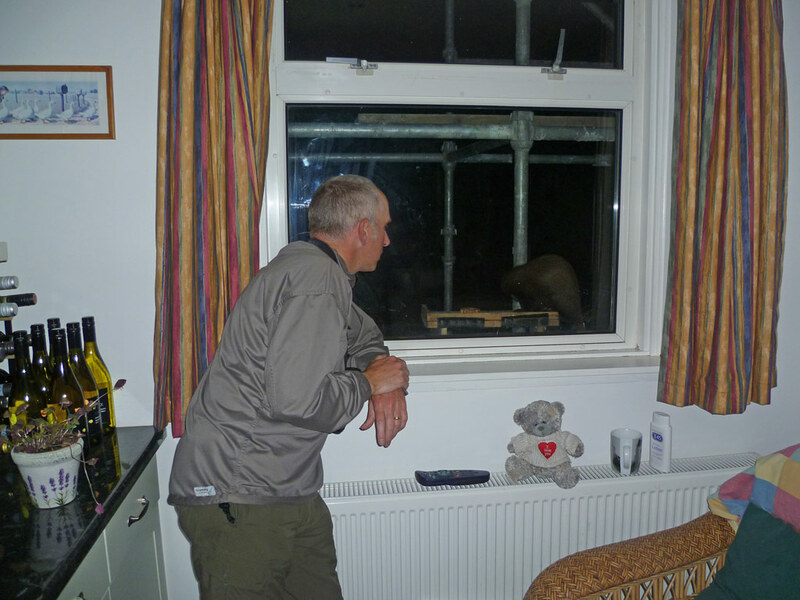 John F. Wright, Dave Bickerton, Tony Disley and Tim Davie. 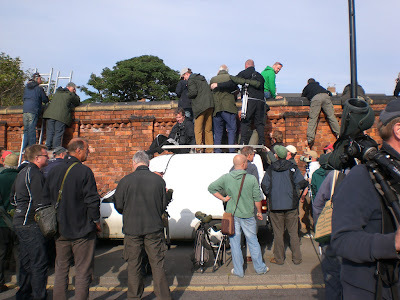 All saw the bird, but we left at the height of the anarchy that was the scaling of the Doctor's Garden wall and I didn't ascend a ladder. 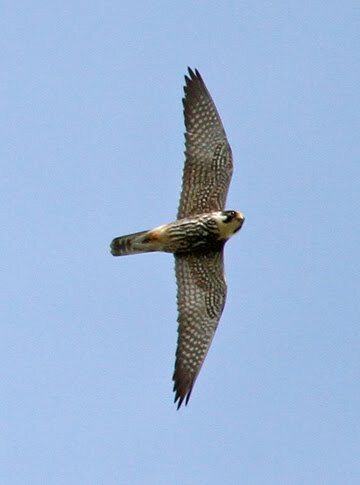 Although I had obtained two good, but brief scope views of the bird in the shrubbery by the inner bowling green, with hindsight, I should have ascended the wall for more views. 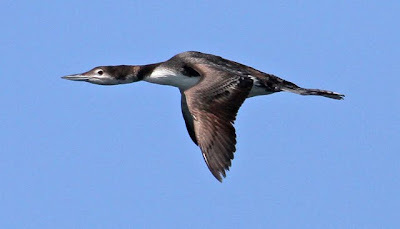 Sadly, I didn't and never got an opportunity to return before the birds departure. I personally haven't witness anarchy at a twitch since the heady days of the Golden Winged Warbler and Red-breasted Nuthatch way back in 1989. 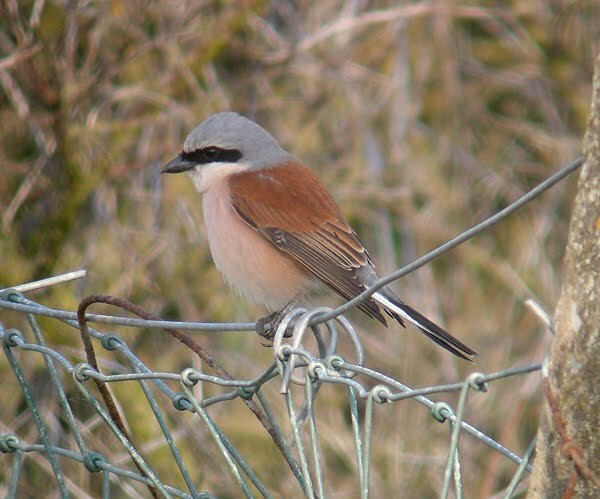 Below: Leaving the anarchy that was the White-throated Robin twitch behind, we headed down to Seaton Sands Nature Reserve where an absolutely stunning male Red-backed Shrike was performing very well. 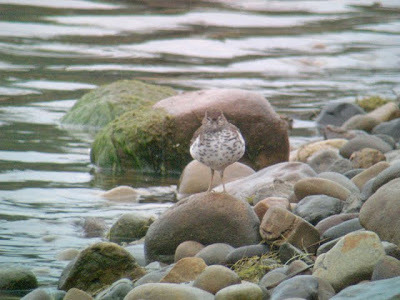 Local patch: Spotted Sandpiper, Brockholes Nature Reserve LWT, Lancs - 30th May 2011. The past two weeks on the local patch had seen some excellent wader passage through the site thanks to a persistent westerly airflow, coupled with cloud and showers, THE best weather and wind direction for good general passage through the site in my opinion. 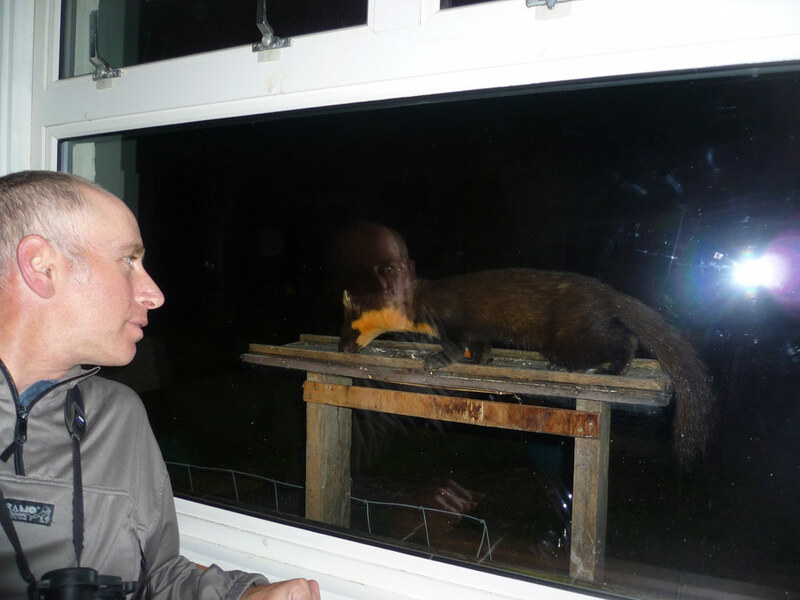 Crucially, I also had the availability to spend lots of time onsite and had been putting in lengthy daily visits of up to 11.5hrs. 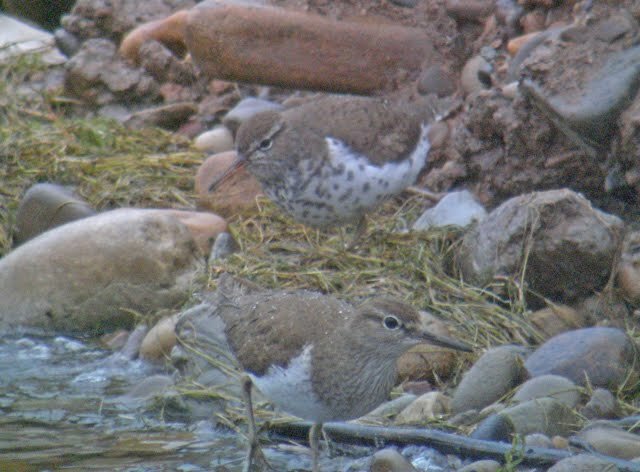 Totals of some of the species recorded during the period included: 1+ Wood Sandpiper, 1 Little Stint (first spring record since 2000), 24 Turnstone (including a site record flock of 15), 22 Sanderling (including a site record flock of 8), 1 Grey Plover, 5 Knot, 1 Bar-tailed Godwit (the 5th record this spring), 3 Black-tailed Godwit, 15 Whimbrel (moving NW, not roosting), c100+ Dunlin & c120+ Ringed Plover (involving many birds moving straight through and maximum numbers of 20 grounded birds of both species), 6 Arctic Tern, 5 Common Tern, Little Gull, Garganey, Osprey & Blue-headed Wagtail. 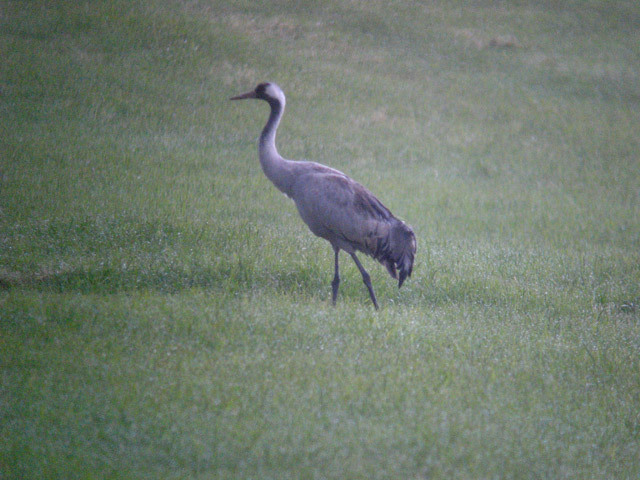 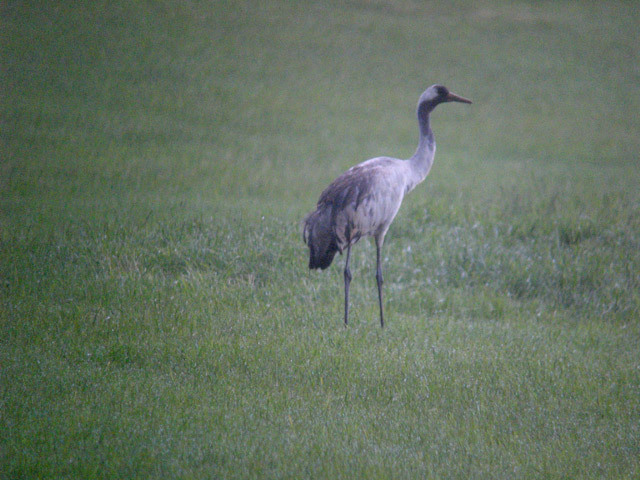 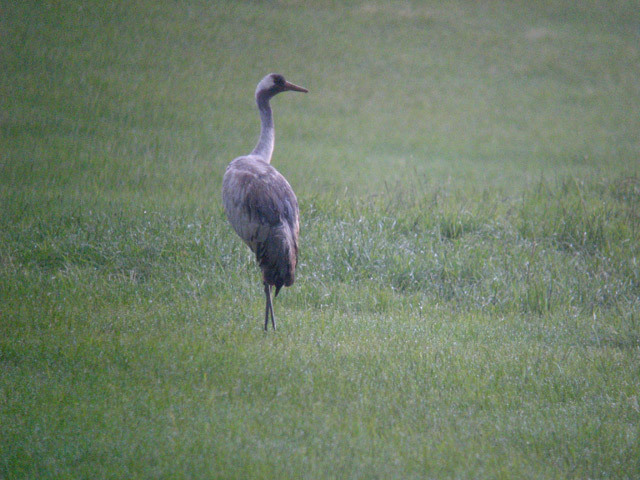 The morning of 30th May saw me once again on the patch at 07:15, later than planned. 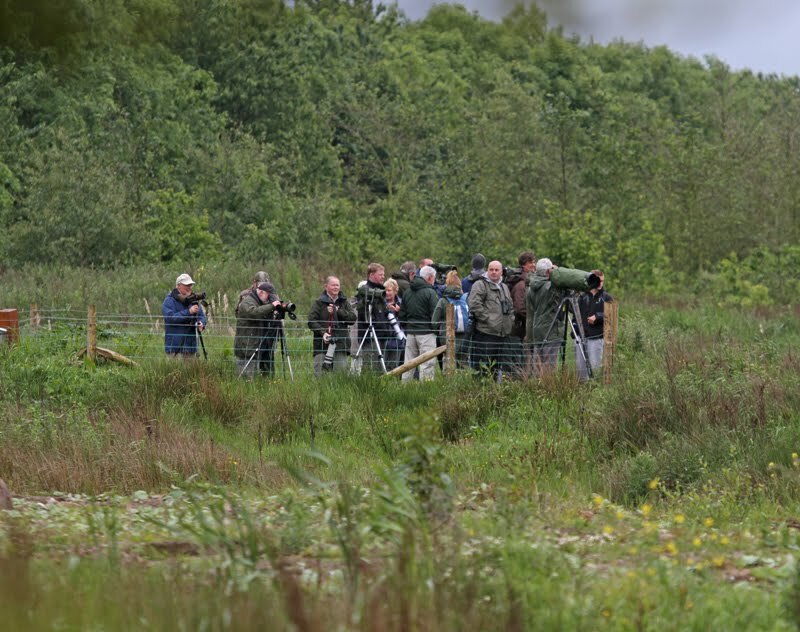 Tom Darbyshire (TD) was already onsite and viewing from the ‘Family Hide’ viewpoint on No1 Pit. We chatted briefly and I complained that although the weather was cloudy with rain, the westerly had died to the point that there was virtually no wind which I thought may curtail passage through the site. 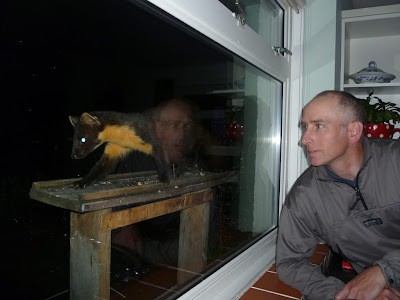 And on that note I moved on to walk my usual route, meeting Roy Lambert (RL) briefly enroute. Having walked and checked the M6 end of No1 Pit, I arrived at one of the back pits, now known as Ribbleton Pool, which has a small edge I have been keeping an eye on for perhaps a sneaky Temmincks Stint. 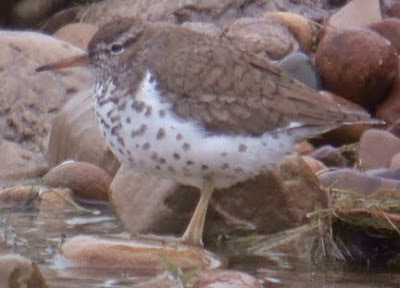 In heavy rain, a scan with the ‘bins’ revealed a ‘Common’ Sandpiper at some distance on the far side, which I scoped, and was confronted by a bird front-on showing not the clearly demarcated & fairly solid breast of an obvious Common Sandpiper, but instead a ‘peppered’ breast which extended further down the underparts onto the belly, giving at quite a distance an impression of dirty underparts. I withdrew my eye from the scope, recomposed, zoomed in further, and took another look as it moved more side-on to reveal spots along the flanks and underparts. It also looked short at the back end, and I exclaimed to myself in no uncertain terms that the bird was a Spotted Sandpiper! I rang Councillor John F. Wright, who coincidentally had just arrived onsite, as well as TD and RL and they all made their way to Ribbleton Pool with a couple of other birders in tow. 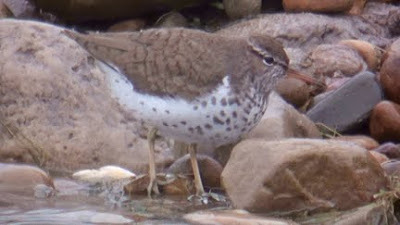 Mindful of a couple of past UK records which were thought to show mixed features of both Common & Spotted Sandpiper, I was keen to obtain the full suite of pro-Spotted Sand features so moved around the pool to join the others where much better, closer views were had over a period of several minutes. 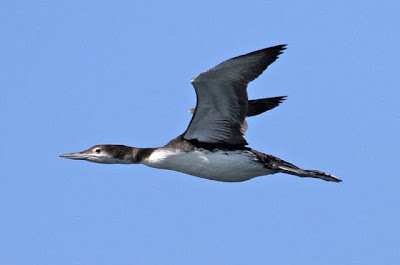 The bird was indeed short at the rear end with only a very short tail projecting beyond the primaries, rather dumpy in shape and the bill was orangey, darkening towards the tip. 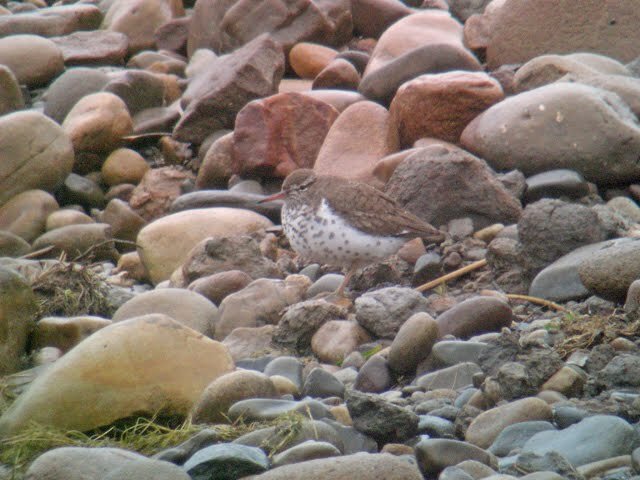 The legs were pale yellow, and although not as bright as I thought they should be were markedly paler and less ochre-green than that of the Common Sandpipers it was seen alongside later in the day. 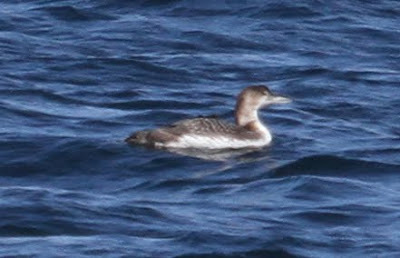 An obvious supercillium flaring behind the eye, dark eyestripe and a broken eyering were also noted. 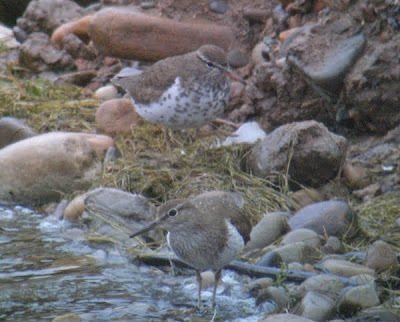 It then decided to fly over onto the NW shoreline of No1 Pit and we were able to note the wingbars were not as extensive as on Common Sandpiper. It was indeed a ‘good’ Spotted Sandpiper in all respects. As stipulated by the LWT, The Brockholes ‘Twitch’ procedure would have to be implemented before ringing the news out wider than the east Lancs text group, so I contacted the reserve manager, Sophie Leadsome, who in turn informed the management and volunteer’s onsite. The Spotted Sandpiper meanwhile was now working its way anticlockwise around the island on No1 Pit, giving excellent views from the Ribble Way footpath hide to the growing gathering of birders, before settling on the shoreline below the artificial Sand Martin breeding wall in the eastern corner of No1 Pit where it showed very well to all comers from the ‘Family Hide’ viewpoint for the remainder of the day. Sadly, the bird proved to be a one-day-wonder, with no sign from first light the following morning. 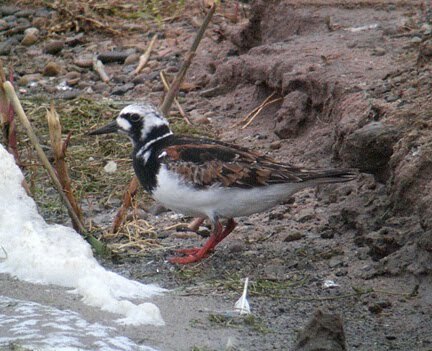 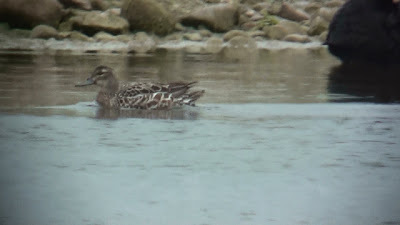 Although some naturally assumed the bird to be the same individual as that recorded at Stocks Reservoir in May 2010 simply moving through Lancashire for the second consecutive spring, the pattern of spotting on the Brockholes bird was different to the Stock’s Res bird and not as bold and blackish in colour. 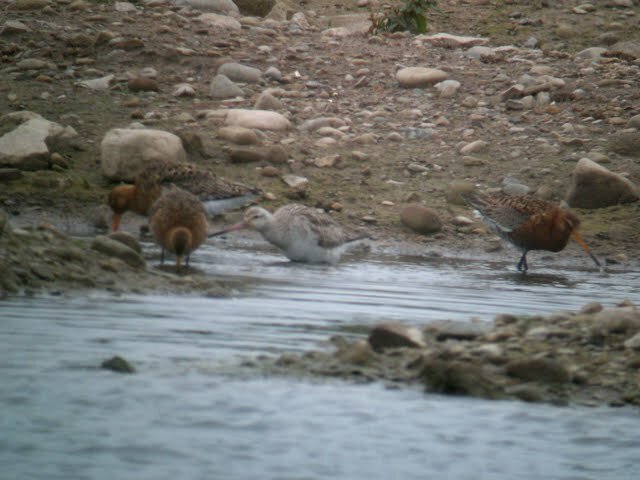 I and others who also saw both have concluded the Brockholes bird to be a different individual, however unlikely some may consider this to be. 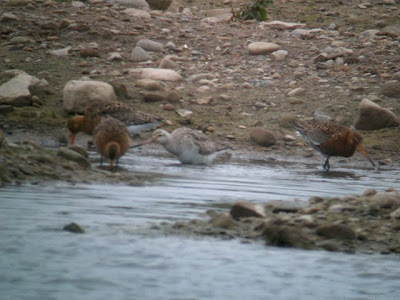 Local patch: Brockholes Nature Reserve LWT, Lancs - 29th May 2011. 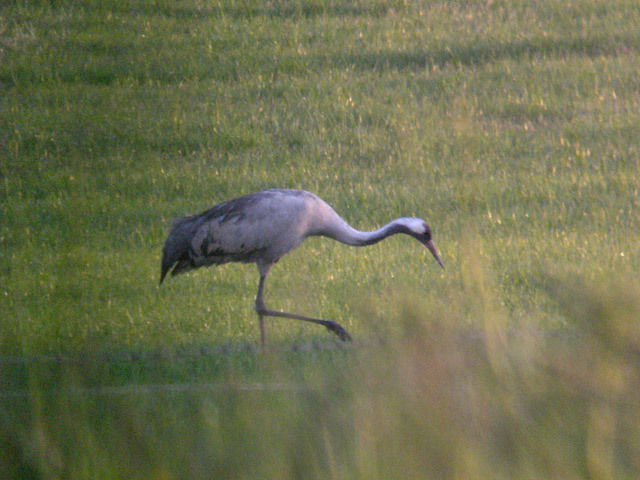 I drove through the night from Scotland, arriving in darkness at the local patch at 03:40. 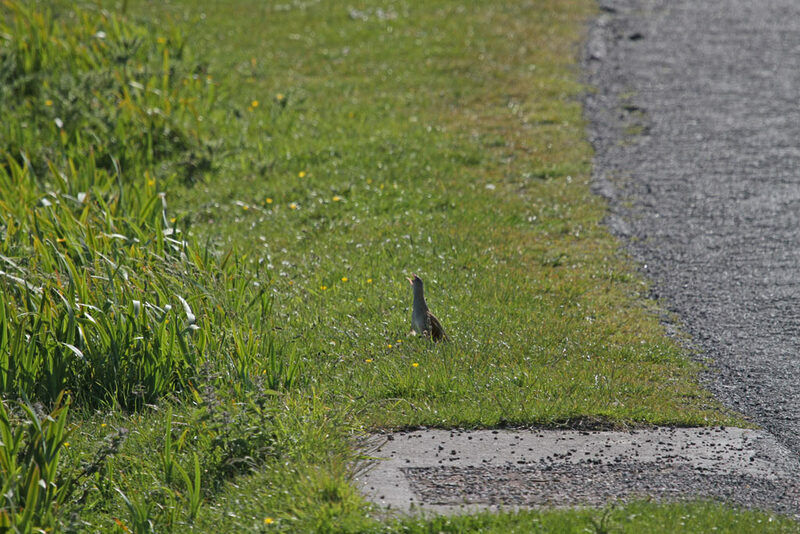 It was well worth it as an excellent morning was had with new-in female Garganey, stunning male Turnstone, 1st summer Bar-tailed Godwit in company with three Icelandic Black-tailed Godwit, and another photographic opportunity with a Grasshopper Warbler. 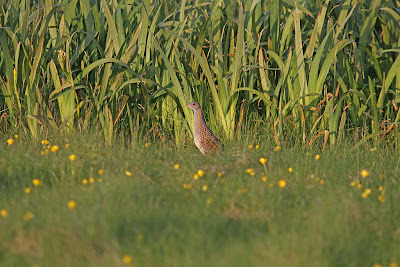 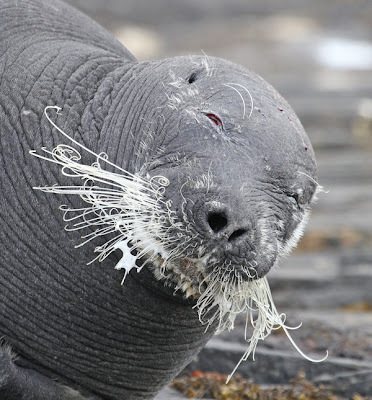 A very approachable animal... when present! Fortunately it was present on both days I looked. I know people who have dipped on it several times. Superb views of a female Red-backed Shrike were also had, at Deerness, but I appear to have lost the images taken!